Beginning on Black Tuesday, October 29, 1929, when the value of the New York stock market fell dramatically, and ending in 1939, the Great Depression was a time when Canadians suffered unprecedented levels of poverty due to unemployment. The unemployment rate was approximately 30 per cent and one in five Canadians depended on government relief for survival. 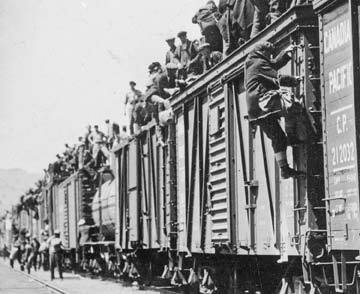 The extent and duration of unemployment during these years rapidly exhausted the ability of volunteer organizations and municipal and provincial governments to relieve the suffering of the unemployed and their dependants, prompting public demands for the federal government to solve the problem through make-work projects, increased spending and intervention in formerly strictly provincial jurisdictions such as social services. The breadth and depth of human misery resulting from the Great Depression and the creative responses it prompted in individuals are vividly described in letters recounting how families bartered food in exchange for medical services. R. B. Bennett’s Conservative government initially opposed increases in federal spending and an expansion of the federal role in social welfare because Bennett believed that free enterprise and tariffs would protect Canadian industry and ensure access to export markets. However, neither Bennett’s policies nor those of William Lyon Mackenzie King had the desired effect on the Great Depression, and many Canadians emerged from the period haunted by memories of poverty and acutely aware of the need for access to health care. 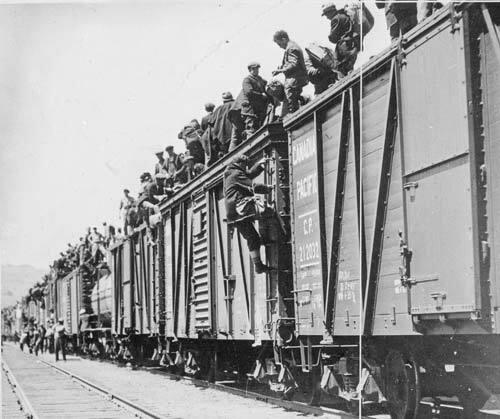 Strikers from unemployment relief camps established by the federal government in British Columbia and Ontario on their way to Ottawa to complain about camp conditions, 1935. Their journey was stopped in Regina.